Have you noticed something off with your toenails? Are you starting to see yellow or white spots underneath your toenails? Do they seem to crack, thicken or discolor the edge of your toenails the more you ignore the symptoms? If yes, then you may have toenail fungus. It is an infection that gets in through the cuts in your skin or cracks in your nails. Fungi grow in damp and warm places, making our toes a perfect breeding place. Our feet also have lesser blood flow compared to our hands so it’s harder for the body to ward off infection. Toenail fungus is known as onychomycosis. But unlike athlete’s foot that affects the skin between your toes or the bottom of your foot, it affects your nails. It usually develops over time so any difference in your nails may be hard to notice at first. It can be very painful. When this happens, it’s time to observe self-care steps or try medication. Toenail fungus can affect anyone but is more common among older people. This is because the nail gets dry and brittle as it gets older and the resulting cracks make it easier for fungi to enter. A weak immune system, circulation problems, or diabetes. A family history of athlete’s foot. Toenail fungus can look like psoriasis, that’s why it’s important to have your toenails checked regularly. You can go to a dermatologist (doctor of the skin) or a podiatrist (doctor of the feet) for this. They’ll scrape off some of the affected areas and check it under a microscope. They may even send the sample to a lab to find out what the real problem is. Severe nail fungus can cause permanent damage to your toenails. It can spread beyond your feet and lead to other infections if you have a suppressed immune system. Especially if you’re taking medication for other conditions. People with diabetes may experience low blood flow and nerve supply in the feet. This also puts them at greater risk of skin infection, and that includes nail fungal infection. Basically, any minor foot injury can lead to serious complications. So if you have diabetes or any serious medical condition, visit your doctor if you feel you’re developing toenail fungus. Other complications are a permanent loss or a total discoloration of the affected nail. It can even lead to cellulitis, a skin infection that causes redness and swelling to the skin that is hot and tender to the touch. Use soap and water when washing your feet and dry them well. Wash your hands after touching a nail that’s infected, and don’t forget to moisturize afterward. Cut your nails straight across so that they’re shorter than your toes. File down the edges and the areas that have thickened and sanitize your tools after using them. 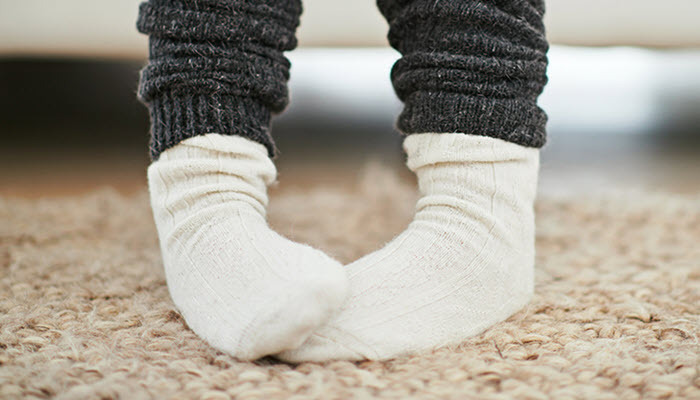 Change your socks throughout the day or wear socks that help absorb sweat. Choose shoes that fit well. They should also be made of materials that let air circulate like mesh, canvas, or leather. Throw away old shoes or sprinkle your feet with antifungal powder before using them. Do not go barefoot in wet public areas. Wear shower shoes or slippers in the locker room or pool area. When going for a manicure or a pedicure, ask nail salons how often they sterilize their tools. Tools like clippers or emery boards can spread fungal infections if they aren’t sanitized. Don’t make them cut your cuticles as this causes small breaks in the skin where germs can enter. Inspect your toes at least every month. Check your nail bed and the skin around your toenails for any discoloration or changes in texture. Do they hurt? If the pain doesn’t go away or the symptoms worsen, it’s time to call your doctor. The way nail fungus is treated depends on the type of fungus that causes it and how severe the infection is. Some may even take several months before you start seeing results. A topical prescription like a cream or nail lacquer. These go directly on the nail and applied just like nail polish. However, they’re not that effective to cure toenail fungus. Oral prescriptions like griseofulvin, fluconazole, itraconazole, and terbinafine. Take note that over-the-counter products aren’t recommended since they don’t give reliable results. Laser treatment or surgery. This means either removing the damaged part of your skin or nail or having the entire nail removed. This is for really severe cases when oral or topical treatments don’t work. Treatment can’t be considered done unless a new nail has grown in. And though a new nail has already grown in, it doesn’t mean it won’t get infected again. Having nail fungus is a problem that can occur to anyone. It is more common than you think, so don’t feel ashamed if you think you have it. As we’ve mentioned, toenail fungus can be avoided by practicing good hygiene. Give your feet the same treatment you give your body. Also, never share footwear with anyone. This will only increase your chances of having toenail fungus, especially if the other person already has it. But if you think you’re already infected, the best step is to check with your doctor. There are a lot of options available to treat this disease.